The Apex sees the return of two giants in the popular folk scene next month; Lindisfarne on Sunday 7 October and Ralph McTell on Wednesday 10 October. Lindisfarne emerged from Tyneside in the 1970s and quickly carved out a place for themselves as one of Britain’s most original bands. Their pioneering sound, which combines acoustic instruments like mandolin and fiddle with their electric blues roots, provided the perfect medium to deliver their catchy, memorable songs, which earned them chart hits, worldwide success and a reputation as festival favourites. The original band finally called it a day in 2003, but now Lindisfarne are back with a classic six-piece line up fronted by original founder-member Rod Clements (on vocals, mandolin, fiddle and slide guitar). Rod is joined by Alan Hull’s son-in-law Dave Hull-Denholm and long-time members, such as Charlie Harcourt and Steve Daggett. On 7 October you can hear their repertoire of much-loved songs, including ‘Meet Me On The Corner’, ‘Fog On The Tyne’, ‘Lady Eleanor’ and ‘Run For Home’. One of music’s greatest storytellers, Ralph McTell (10 October) is celebrating more than 50 years on the road. A prolific and gifted songwriter with a narrative that is both significant and poignant, Ralph is also renowned for his intuitive and dexterous guitar playing. Part of an itinerant and disaffected youth movement, McTell travelled widely and played guitar whenever he could. He hitched to Paris in 1965 where he began writing songs in earnest. On his return to England, he played folk clubs up and down the country. At the 1969 Cambridge Folk Festival, the audience surprised him by singing along to ‘Streets of London’, which he'd written in Paris and only performed at folk clubs gigs. In 1974 ‘Streets of London’ earned him an Ivor Novello Award and in 2002 he was presented with the prestigious 'Lifetime Achievement Award' at the BBC Radio 2 Folk Awards. Despite rejecting convention, he has carved a successful touring and writing career, and his songs continue to sell well to this day. From charged political commentary to quiet personal reflection, his songwriting continues to probe and question without diatribe and polemic. Shows start at 7.30pm and tickets prices are £25 (for each show). 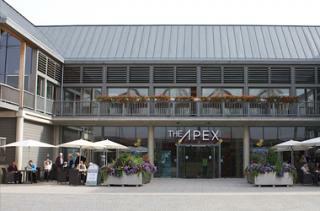 Ring The Apex box office on 01284 758000 or see the website www.theapex.co.uk for more details, or to book. Offers a range of products includes car, home, van, taxi and specialist insurance.